These words, written by Johannes Kepler in 1611, are profound. At the time, Galileo had just discovered the Galilean moons (including Europa) in Florence but was being persecuted for his belief that the Earth orbits the sun. 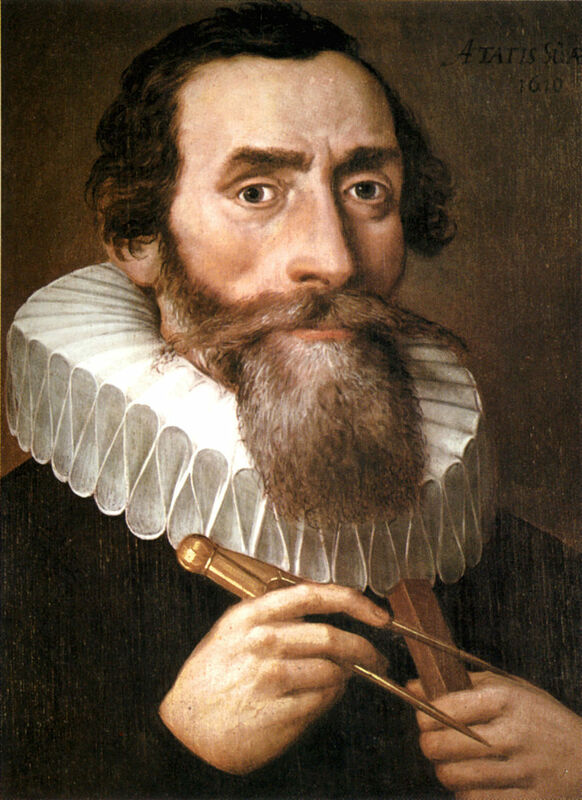 Kepler, a staunch supporter of heliocentrism, was working as the Imperial Mathematician in Prague. When word that Galileo had used a telescope to find the moons reached Kepler, he was so fascinated and impressed that he wrote an enthusiastic letter of support and scrawled that pithy aphorism. While Kepler enjoyed some social status as Imperial Mathematician and was much more free to contradict Aristotle than his Italian counterparts, his life was by no means a charmed one. The son of “an immoral, rough and quarrelsome soldier” (his own words), Kepler managed to carve himself a place in history based on his skill as a mathematician and astronomer. He kept on working through many family disasters, including the deaths of his wife and his seven year old son and a witch trial about his mother. Kepler was a devout Christian and grew up Lutheran but was excommunicated due to his rejection of the Augsburg Confession. This left him neither a Lutheran nor a Catholic and between sides when the Thirty Years War broke out in 1618. You’ve got to love that frilly collar. Just like Shakespeare! Actually, come to think of it, Kepler lived at the same time as Shakespeare. I wonder if they ever met and what they might say to each other at a dinner party. Image is public domain. Despite all of this, Kepler revolutionized astronomy by formulating mathematical laws that accurately describe the motions of the planets. These are still taught in astronomy today and are called Kepler’s Laws. 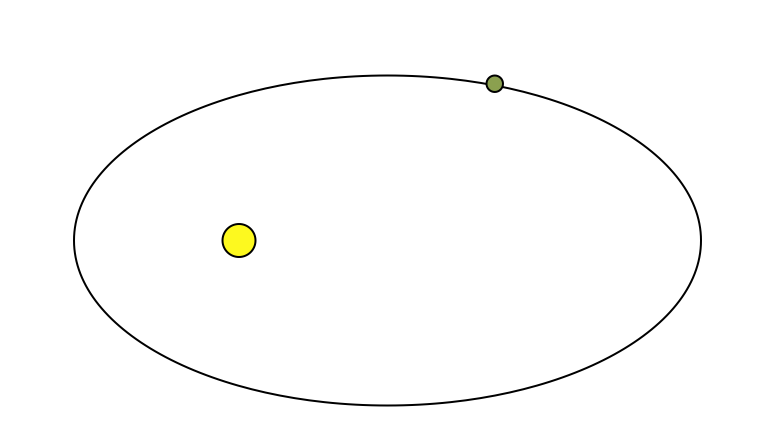 The first law is that planets orbit in ellipses with the sun at one focus. Before Kepler, most Western astronomers modelled the orbits of planets as circles and had to invoke a strange concepts like epicycles and equant points. The third law, formulated after the first two, is that the time it takes a planet to make an orbit (orbital period) is directly proportional to its distance from the star. This law allows astronomers to calculate how far a planet is from its star based only on information about the length of its year and the mass of the star. Remember this one, because it will become important later. As you can see, Kepler’s Laws are fundamental to our understanding of how planets move, or orbital dynamics. It will come as no surprise then that every young astronomer is all too familiar with Kepler’s laws. This isn’t the only reason he’s familiar though. He is also shares a name with the most successful exoplanet hunter the world has ever produced. The Kepler Space Telescope. 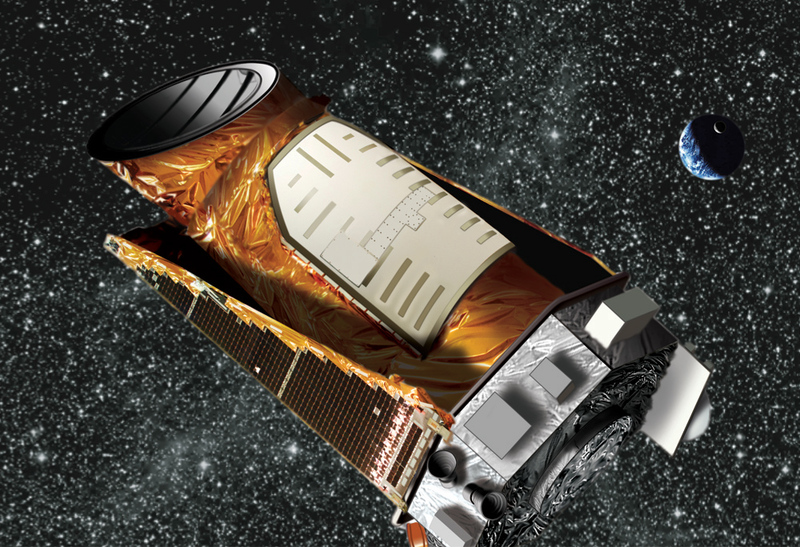 Launched in 2009, the Kepler Space Telescope used 42 image sensors to continuously observe over 145,000 stars. Unlike a lot of other telescopes that try to take magnified images, Kepler wasn’t interested in images. It wanted accurate data on brightness. It basically had a staring contest with these 145,000+ stars, waiting for them to blink. I say blink because Kepler was waiting for the brightness to go down and back up. The brightness of stars can vary for all sorts of reasons, but planets passing in front of their stars make the brightness dip in a particular way. This dip is called a transit and finding transits was Kepler’s mission. 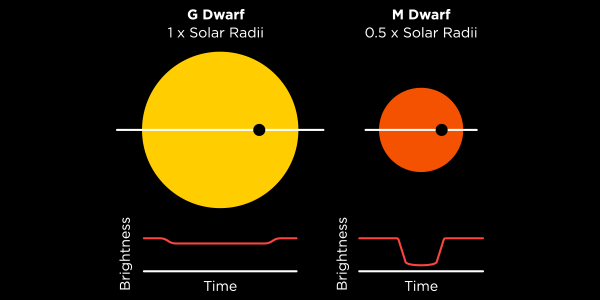 When a transit occurs, the size of the brightness dip corresponds to the size of the planet and the length of the dip corresponds to the time it takes a planet to orbit (as well as the size of the star). Remembering Kepler’s third law, if we know the time it takes to orbit, we can figure out the distance to the star. And if we know the brightness of a star and the distance, we can figure out how much energy the planet receives. Plug all that in to a simple(ish) equation, and out pops temperature. Stars, just like planets and people, come in all different shapes and sizes. That means light curves also vary widely. Image from Planethunters.org, a great citizen science project that combines people’s natural pattern-finding ability with Kepler data to find planets. So thanks to the Keplers (both Johannes and the Space Telescope) we can start to look for alien worlds that have temperatures similar to the ones we find here. The hope is that one day we will find evidence of life on another planet. And then we can begin our transition into any one of several sci-fi galactic civilizations (my personal favourite is Foundation, but some people prefer Star Wars, Star Trek, or Eve Online). Unfortunately, in May 2013 one of the components that kept Kepler (the telescope) stable failed, meaning the mission was apparently over. The mission had been hugely successful, discovering over 1000 confirmed planets, with 4000 other planet candidates waiting to be confirmed. It turns out that most stars probably have planets and that a lot of planets in the galaxy might be the right temperature to be habitable. Astronomers are nothing if not persistent though, so an ingenious method was devised to make sure Kepler can continue observing even without its stabilizer. 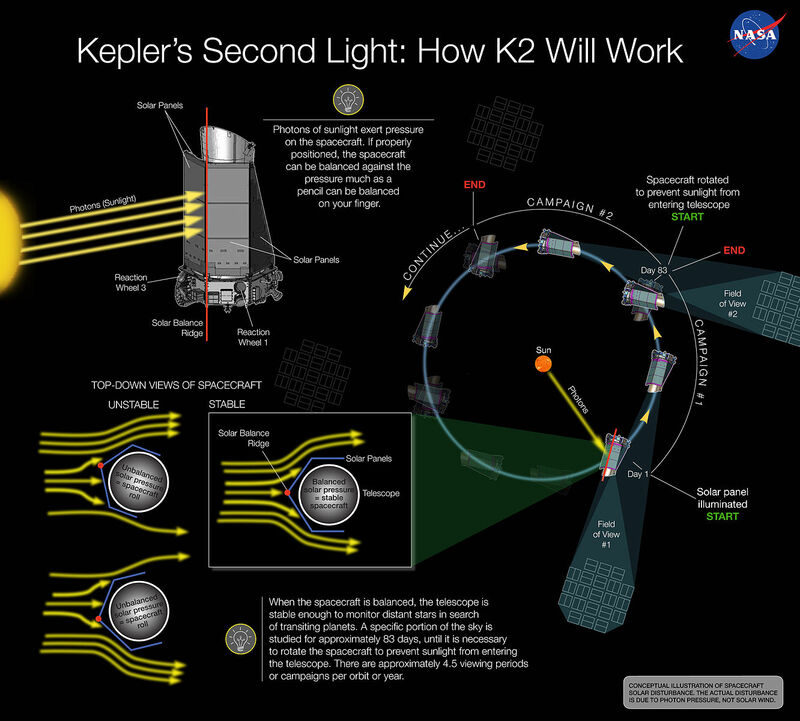 This new mission, dubbed K2, uses the radiation pressure from the sun itself to balance the telescope. Instead of continuously observing the same 145 000 stars, K2s targets will change periodically as it orbits the sun. There will be far less data coming down, but as of this writing four new planets have already been found since K2 began in earnest in June 2014.